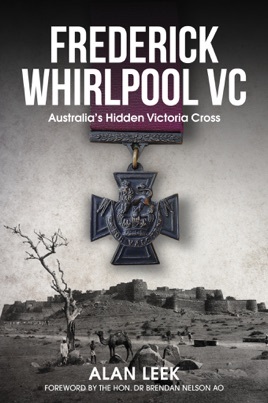 Frederick Whirlpool’s Victoria Cross is displayed near the entrance to the Hall of Valour at the Australian War Memorial, Canberra. It was the first VC pinned to an Australian uniform, yet almost nothing was known about its enigmatic recipient. Two acts of valour during the Indian Mutiny, won him the Victoria Cross, but 17 severe sword wounds ended his career. Arriving in Victoria in 1859, he became a volunteer rifleman and school teacher. His VC was presented in Melbourne in 1861. He applied to join the Victorian Police, but corruption and unsolicited political interference prevented it. Repulsed by fame, he fled and hid his cross from the world. Fragments of his story were known, but since 1895, they have been tainted by error, guesswork and in one recent British work, pure fantasy. This work solves an old mystery. It reveals his true identity and early life in Ireland before joining the East India Company Army. Rich sources reveal his anguished story. The passage of his Victoria Cross, after his death was unknown before it appeared on the market in 1927. Its movements and those of his Indian Mutiny medal with its Central India clasp, re now revealed. This fascinating story fills huge gaps in the narrative of this ordinary man, whose life is deserving of factual interpretation. It is a story of heroism, suffering and failure, but the forgotten man will triumph in its telling: the true story of this sad and purposefully enigmatic hero.